Our government knows that improving the territory’s infrastructure is critical for our economy, and for maintaining the quality of life for communities throughout Yukon. This week our Member of Parliament Larry Bagnell and I announced that the Government of Yukon and the Government of Canada would be spending over $78 million on 17 road, bridge and other infrastructure projects throughout the territory. Just a few weeks ago, I traveled to Ottawa to sign an agreement with the federal government to access new infrastructure money that will fund 21 projects around Yukon, worth $68 million, specifically for drinking water and wastewater. Yukon was the first jurisdiction in Canada to sign onto this new agreement and to access this money. 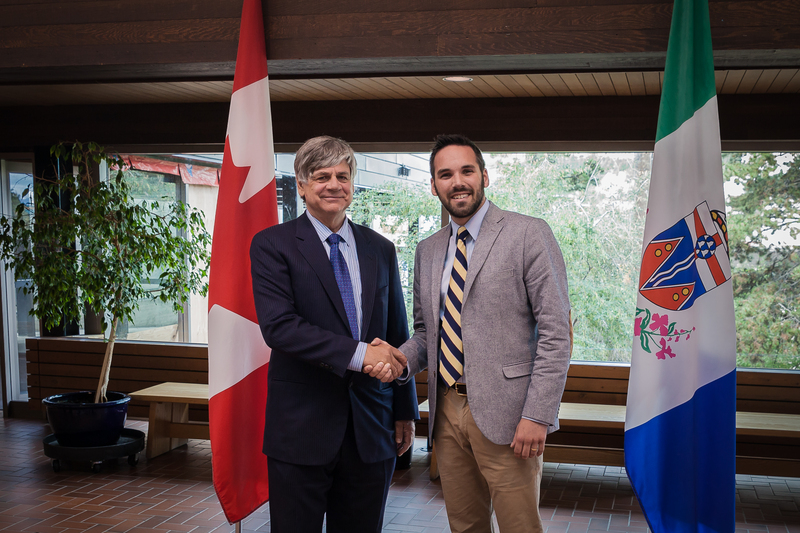 Altogether, MP Bagnell and I have announced over $150 million in infrastructure funding for Yukon since March. These investments have many benefits for Yukon. Repairing and upgrading roads and bridges facilitate economic activity; water and wastewater projects maintain and improve the quality of life for small communities throughout the territory; and the construction of these infrastructure projects creates jobs and economic activity for Yukon businesses. Both the Government of Canada and the Government of Yukon have made infrastructure investment a priority and through our close working relationship and partnership, we’ve been able to make these considerable investments. For the Yukon government’s part, we’ve been able to do this while maintaining a balanced budget and avoiding taking on any net debt. Were it not for our strong financial position, these investments wouldn’t be possible. Community Services Minister Currie Dixon and Yukon MP Larry Bagnell at the announcement earlier this week of over $78 million in federal/Yukon investment for road, bridge and other infrastructure projects in Yukon. Likewise, the work occurring in Yukon municipalities would not be possible without the support, participation and input of municipal governments. Over the course of the past year, we have worked closely with Mayors and Councils to identify projects and ensure that our priorities are aligned. In Faro, upgrades will be done to the sewage lagoon and, in Haines Junction, a new wastewater station and building will be constructed. In Whitehorse, 6th Avenue will be reconstructed between Ogilvie and Jarvis Streets. 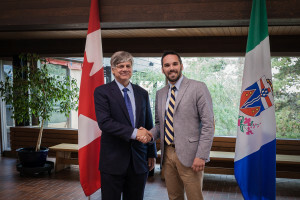 In many cases, projects occurring in municipalities would not have been possible without this investment from the governments of Canada and Yukon. There is also significant work occurring beyond our municipalities. This week’s announcement also included around $40 million in funding for bridges and highways. Over the course of the next few years, the Nares River Bridge in Carcross, the Yukon River Bridge in Carmacks, the Nisutlin Bay Bridge in Teslin and the Fox Creek Bridge near Lake Laberge will see replacement, rehabilitation, or improvements. As these various projects roll out, I look forward to seeing the economic and social benefits that they will bring over the course of the coming months and years. Our water, whether we use it for drinking or recreation, is a precious resource and one that we sometimes take for granted. Water supply upgrades are often expensive and highly technical but they are a high-priority investment for public health and safety. Much of the territory’s original drinking water and wastewater infrastructure was constructed in the 1960s and ‘70s. Like buildings and other infrastructure, these water systems have service lifespans and periodically need revitalization. Over the past number of years, Yukon government has maximized the use of joint-funding programs and worked with our partners to provide upgrades to our water and wastewater treatment facilities in our municipal, First Nation and unincorporated communities. We are fortunate to have a good water supply and drinking water we can trust but it has only come through deliberate and consistent investment. Earlier this week I had the honour of signing a new agreement with the federal government that will help Yukon access more funding for clean water and wastewater infrastructure in our territory over the coming years. Due to our strong relationship with the Government of Canada, we are the first jurisdiction in the country to sign such an agreement on water infrastructure and it allows us to continue this important work in our communities. The projects that benefit from this funding include infrastructure that we’ve jointly identified as priorities for municipal governments in the revised Yukon Infrastructure Plan, such as a new drinking water reservoir for Watson Lake and upgrades to the Haines Junction sewage lagoon. The new investments will be delivered in a 75/25 per cent funding split between the federal and Yukon governments. They will help us continue to ensure that our drinking water supply remains modern, safe and sustainable and that our wastewater is dealt with appropriately. These are not only investments for us, these are investments for our children and for others who will call Yukon home in the future. We have been focused on this important work with our partners for a number of years. Most recently, we opened brand new water treatment plants in Tagish and Deep Creek. Not to mention the countless changes and upgrades to the water and wastewater treatment facilities found across the Yukon from Old Crow to Watson Lake. Many of these facilities are constructed to post-disaster standards that will ensure public health and safety, and last for many years to come. I should also mention our Domestic Water Well Program that has provided more than 250 rural properties with access to drinking water in the last few years. Finally, I would like to highlight our Yukon Water Strategy and Action Plan that we released in 2014. This plan’s goals include focusing on water for nature and water for people. Maintaining Yukon’s public drinking water supplies and treating our wastewater properly are a vitally important part of that strategy. Year after year, Yukon’s young athletes continue to impress me with their skill, dedication to sport and sense of fair play. This was made clear once again this year by Team Yukon’s incredible performance at the recent Arctic Winter Games in Nuuk, Greenland. Our contingent of 320 members brought home 100 ulus and 12 fair-play pins. I attended the games myself, and saw first-hand that the trip to Greenland was a life-changing experience for our athletes as they forged new friendships, strengthened bonds with teammates, and learned from unique cultural experiences. The Government of Yukon provided more than $1 million to support Team Yukon’s attendance at the games, and if you ask anyone who attended, it was money well-spent. I see the team’s success as another sign that our investments in sport and recreation are paying off. Our government believes that access to sport and recreation opportunities is an essential community service for all Yukoners. Engaging in physical activity provides personal, social, environmental and economic benefits. It fosters individual health, and community well-being. For that reason, Yukon’s sport community received more than $1.4 million in funding in 2015/16, provided through partnerships between the Government of Yukon, the Yukon Lottery Commission and Sport Canada. To support recreation in the territory, the Yukon government provided just over $1.1 million dollars in 2015/16 to community and other recreation groups to support programming and regular operations. From supporting community recreation, to providing funding for the development of athletes, coaches, and officials, we are committed to improving the opportunities for sport, recreation and active living for all Yukoners. To help make this a reality, last month we released the Yukon Sport Action Plan in partnership with the territory’s many sport organizations. The plan sets out our government’s goals for sport in the territory for the next seven years. It is a guide to how we will develop, deliver and pursue excellence in sport. Most importantly, it will help us build the type of sport we want to see in our territory: sport that is fun, fair, inclusive and supportive of excellence. It offers a strategy for building our sport system by increasing sport participation, improving sport performance, strengthening sport capacity and raising awareness of the benefits of sports to communities. To help communities provide better recreation programming to their citizens, we released the Yukon Community Recreation Planning Toolkit in January of this year. The toolkit, which is easy to use and adaptable for all rural communities, outlines a five-step process to help create a community recreation plan. Another indication that Yukon is making the right investments in sport and recreation came in January, in the form of a major national prize for a Yukon-led recreation initiative. The Tri-Territorial Recreation Training (TRT) Project, which is led by the Recreation and Parks Association of the Yukon (RPAY), was awarded a $600,000 Arctic Inspiration Prize. This prestigious prize recognizes extraordinary contributions by northern organizations that benefit not only the North, but Canada as a whole. The TRT project aims to improve recreation opportunities for people in the Canadian Arctic by providing training to community recreation leaders. The TRT team includes the NWT Recreation and Parks Association, Nunavut Recreation and Parks Association, and the governments of all three territories. Ultimately, the positive impact of sport and recreation comes down to individuals – the athletes, parents, coaches, officials, administrators and volunteers who dedicate their time and expertise to help make Yukon a healthier, happier place to live, work, play and raise a family. Here in the North, many of us use wood stoves or oil furnaces to heat our homes. It’s important to be aware of what we can do to use these appliances safely. Carbon monoxide (CO) is a highly poisonous gas that you can’t see or smell. It’s created by appliances that burn any kind of fuel – oil, propane, wood and kerosene. At high levels, it can kill in minutes. According to Statistics Canada, there were 380 accidental deaths caused by CO in Canada between 2000 and 2009. If fuel-burning appliances are incorrectly installed or vented, or have been poorly repaired or maintained, carbon monoxide can build up in your home. Last month, the Yukon government passed new regulations as part of its ongoing work to help safeguard Yukoners from the risks of fire and CO poisoning in their homes. Carbon monoxide detectors must now be installed in all residences that have a fuel-burning appliance or an attached garage. All homes must also have smoke detectors. As well, permits to install or modify oil-fired appliances and fuel tanks will only be issued to certified mechanics or their supervised apprentices. A public registry of qualified oil-burner mechanics will be posted to the Community Services website, and is now available at both the Building Safety and Standards office and the City of Whitehorse building inspection office. Building inspectors will also ensure that these devices are installed when conducting regular permit inspections of homes under construction. In advance of these regulatory changes, the Yukon government created the Oil Burner Mechanic program at Yukon College to strengthen local capacity. Students who complete the program will be certified to service, install and modify oil-fired furnaces throughout the territory. Over the past few years, the Yukon government has undertaken public awareness initiatives to improve home safety. The Seriously Simple and Be a Hero in your Home campaigns continue to educate Yukoners about fuel-burning appliance safety. To date, our Fire Marshal’s Office has distributed more than 950 life safety alarms to help keep low-income Yukoners safe and raise awareness about carbon monoxide safety. In fact, just last year, one of those alarms was credited with saving the lives of two Dawson City residents – a reminder to us all to install alarms and ensure they are functioning properly. Home safety is a shared responsibility. I ask all property owners, managers and tenants to ensure that fire and CO alarms are installed and working, that heating appliances are maintained and serviced, and that proper permits are in place. I’d also like to remind Yukoners that CO doesn’t just come from furnaces and wood stoves. Never use a gas range or oven to heat your home. Never burn charcoal or use portable gas stoves indoors. And don’t use gas or diesel generators in your home or garage. Remember: if any fuel is burned, CO is released and must be adequately vented to the outdoors. The Yukon government is leading the way in protecting residents with regulations that are among the most stringent in Canada. We are one of the first jurisdictions to have regulations in place that require carbon monoxide detectors not only in new buildings, but in all existing homes. For more information about carbon monoxide safety go to seriouslysimple.ca or visit our Building Safety Branch either in person or online at www.community.gov.yk.ca/ps/building_safety.html. Yesterday marked a day of elections in Yukon for our local governments. Today, after a brief moment to catch their breath, newly-elected representatives will turn their attention to delivering on their commitment to make a difference in their communities. The Yukon government remains focused on working with our community partners in local government – both new and returning – to support their goals and deliver on their priorities. By working with our partners over the past number of years – from Local Advisory Councils to unincorporated communities to municipalities– we’ve made a lot of progress. 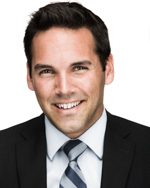 We also work on a government-to-government basis with Yukon’s First Nations. The Our Towns, Our Future initiative remains our framework and foundation for going forward in our work with local governments, as we build on its significant legacy, including a new Comprehensive Municipal Grant, a Solid Waste Findings Report, Community Development Teams, the Municipal Act Review, an online Municipal Resource Library, and most recently a municipal sustainability toolkit and work on asset management. The Comprehensive Municipal Grant, for example, is a significant commitment by the Yukon government in support of municipalities, and we have increased unconditional municipal funding from $12.5 million in 2007 to $18.27 million in 2016. This ensures that our local governments can deliver the programs and services that are important to their communities. At a municipal gala last month, Deputy Premier Elaine Taylor had an opportunity to honour local government representatives who have served their communities over the previous three years. Yukon government also renewed our Memorandum of Understanding (MOU) with the Association of Yukon Communities. This MOU has helped influence our cooperation and collaboration in the past, and will continue to do so in the future. It formally recognizes our shared commitment to foster the development of safe, healthy and vibrant Yukon communities. As part of moving forward together, our Community Affairs team in Community Services will be supporting the Association of Yukon Communities in delivering a training workshop in November for newly-elected municipal government officials. These officials will have an opportunity to gather in one place, meet their peers and learn about their roles and responsibilities in a three-day workshop on a variety of subjects, ranging from good governance to working together with the Chief Administrative Officer (CAO). In closing, I’d like to formally welcome the new local governments and, on behalf of Yukon government, emphasize how much we are looking forward to working in partnership with them to make our territory an even better place to live, work, play and raise a family.